Remember Hans Brinker, the Dutch boy who put his finger in a hole in the dike to save his country? Remember that picture postcard of a row of majestic windmills under a great blue sky? Remember all those stereotypes of Holland, the wooden clogs, canals, bicycles, pancakes, tulip fields, polders, traditional costume? They’ll all come alive in front of your very eyes on this specially designed tour of nostalgia! The tour starts and finishes in Amsterdam allowing ample opportunity for exploring and museums. 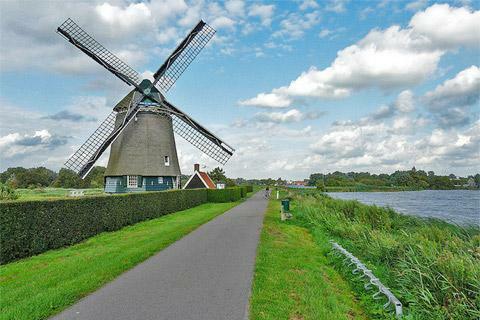 We’ve kept cycling distances short to give you more time at top tourist attractions such as Zaanse Schans and Volendam. The shining countryside is flat, wide open and an oasis of peace. For all those romantic souls who can’t get enough of everything reminiscent of things past, this holiday promises to be a real treat.